Tree Care Service, North York : Tree Cutting : Serving Markham, Newmarket, Aurora, Richmond Hill : Four Seasons Tree Care and Service Ltd.
At Four Seasons Tree Care we celebrate the many blessings we have received by offering some of our time and services where they are needed in the communities we serve. Support to the Southlake Hospital’s Gala Auction. Serving and presenting to municipal pesticide committees. Support for local sports teams. 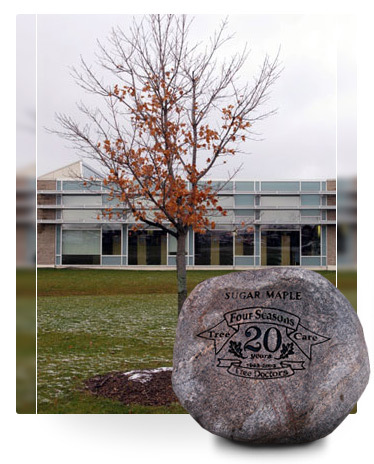 Donation of a Sugar Maple to the Stouffville Parks department in commemoration of our 20th year in business. Lending support to local charitable organizations. Participation in tree planting projects. 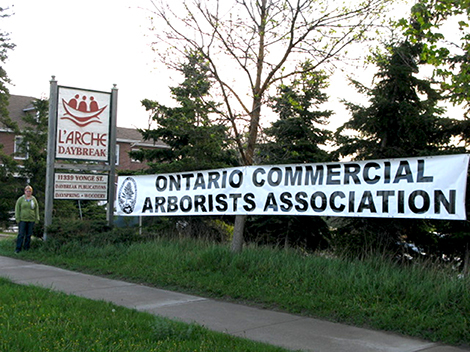 Each year we participate in the Ontario Commercial Arborist Association’s “Day of Service”. This event usually involves 20 to 30 tree care companies who come together for one day and provide approximately $70,000.00 worth of tree care to a worthy organization. In the past these organizations have included public schools, hospitals, Variety Village, Boy Scouts of Canada, L’Arch Daybreak, Blue Hills Academy and Teen Challenge. It has been an honour to take part in providing much needed tree care that was out of reach for such deserving recipients.